Welcome fellow Blogtrotters! 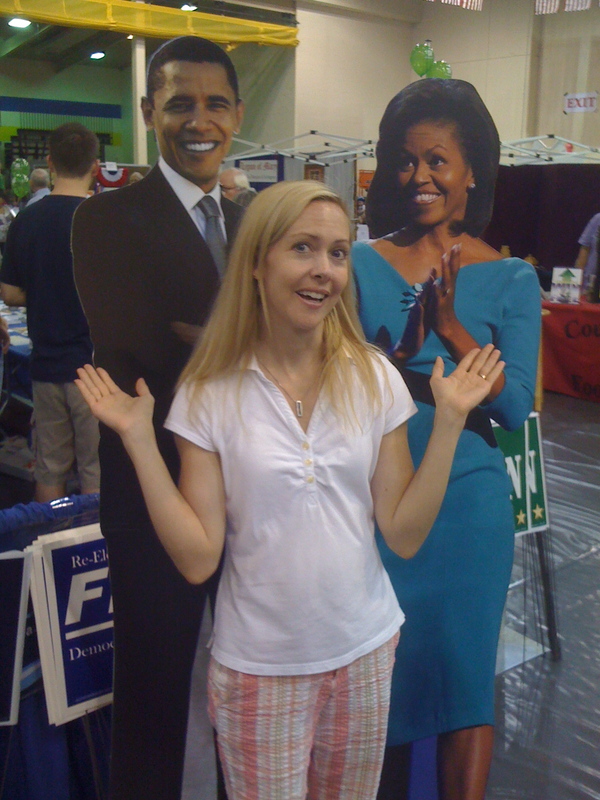 My name is Vicki and my family and I currently live in Arlington, Virginia. We have lived in many a city, state and even country. Second to Germany, Arlington has been my favorite place to live, and we’ve only been here for eight months. If you’ve been blogtrotting long you’ll remember Zahra’s post on Arlington, and it was a fabulous one. So, I’ll try to give you my take on Arlington. When many non-locals mention or think about Arlington they are thinking about Arlington National Cemetery. 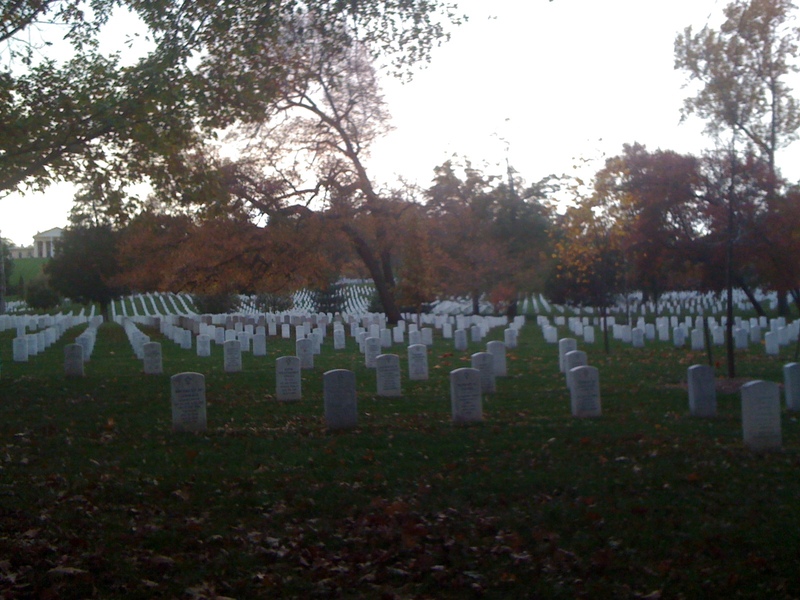 That is a humbling site to behold, but Arlington is so much more. It is a city and county all at the same time. It is old mixed with new. Tradition mixed with modernity. Concrete and parks. Corporations and families. Small-town neighborhoods sitting a block from big-city businesses. Bicycle paths and HOV lanes. We’re a short metro ride to professional sports teams: football, baseball, basketball, soccer and hockey. Across the Potomac is Washington, D.C.; 1.5 hours west are the mountains; 3 hours east are the beaches. Reagan International Airport can get you around the world. Everything is at your fingertips in Arlington. dogs — more prevalent than kids, which reminds me a lot of Europe. joggers — we’ve got to be one of the healthiest cities in the world. Starbucks — no less than 23! parks — the Arlington website lists 127 of them! Many of these are great playgrounds nestled in the many neighborhoods. The county fair! 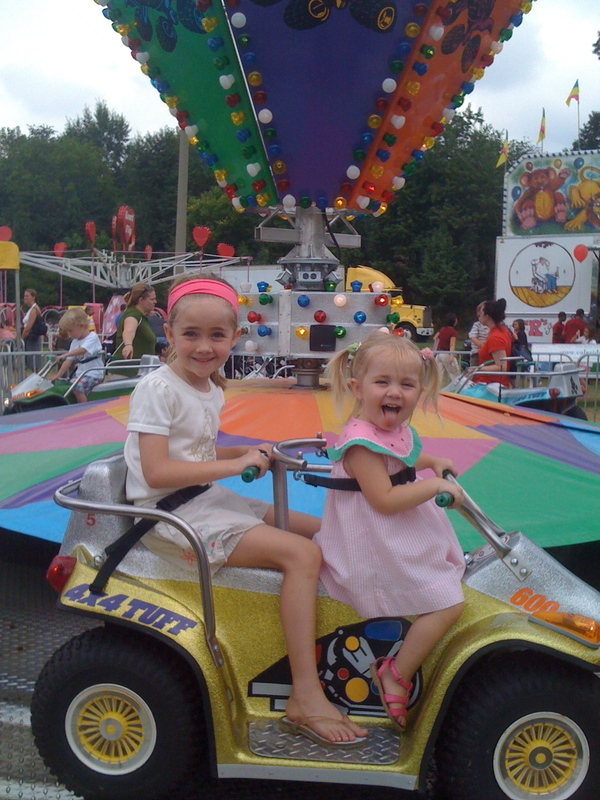 The Arlington County Fair is located right in the city because there is no “country” in the county to have the fair. We’ve met Sergeant York, the horse who carried President Reagan’s boots during his funeral procession. 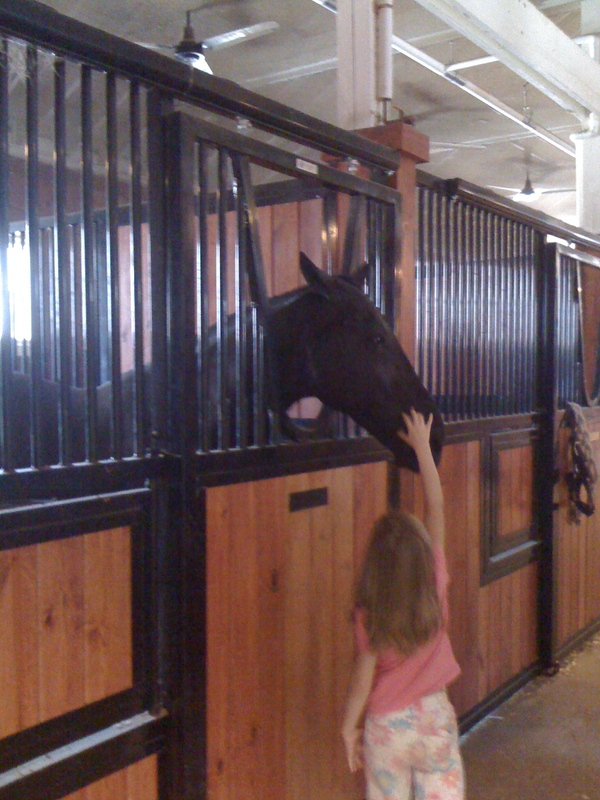 Sergeant York lives at Fort Myer with the U.S. 3rd Infantry’s Army Old Guard Caisson Platoon. It’s not all warm and sunny weather around here. 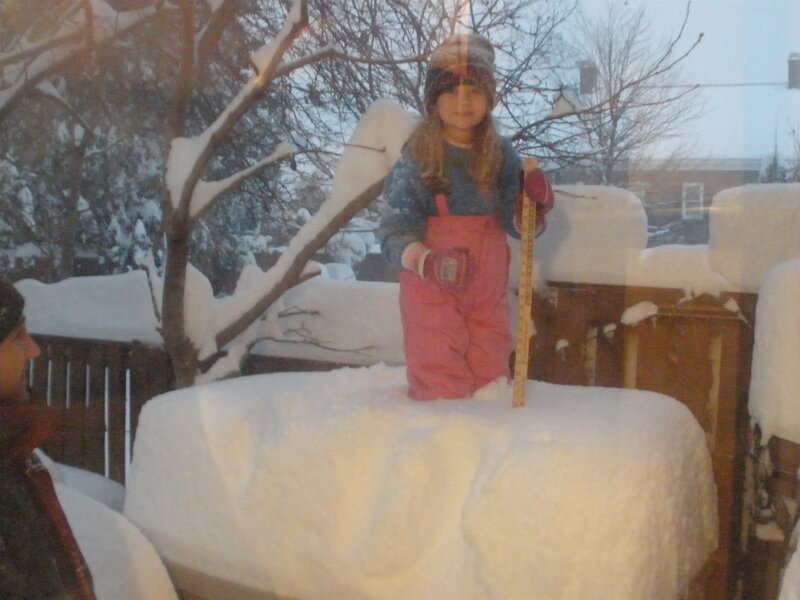 During the winter we got more snow than ever before! There’s a little bit of everything in Arlington and we’ve just begun to scratch the surface. I wish you were all here to experience it with us! Thanks for stopping by! If you would like to get an in-depth, albeit hilarious, idea of one of the bright and growing areas of Arlington, the Orange Corridor (because the orange line of the metro runs through it), watch this “rap” video. It pokes fun at how safe Arlington is and it proves how many Starbucks we have. I love it. And I love Arlington. Vicki, great tour! It’s been a long time since I’ve been to Arlington (um, 18 years long), but I remember how much I liked it there. I’m sure a lot of things have remained the same even though there’s been a lot of change! Thanks for the tour! Can you believe we have none – zip, zero Starbucks in South Africa? And I love their breakfast blend. Looks like a wonderful place to live! I don’t even drink coffee and talk of 23 Starbucks in one town is impressive to me! I don’t drink coffee either. I’m a chai girl, and their chai is pretty wonderful. Too expensive for me to enjoy all the time, but it’s good to know I can get one at almost any street corner. Did you see the changing of the guards at the Tomb of the Unknown Soldier? Lovely photos! Eight public libraries – that sounds like my kind of town. We’ve visited several of them and they’re all great. My favorite part is the self-checkout! I had no idea Arlington was so pet-friendly! I only have cats, though, who are decidedly NOT the types to come along calmly for an afternoon of shopping and a spot of tea. Great tour! Thanks for being a part of BlogTrotting! Cats are all that we have too and you’re right, people would NOT appreciate those two in a store! Nifty tour. Thanks for the insight! I wonder what the differences are between then and now. Were you visiting or staying? I could live in any place that had that many Starbucks, although I gave them up for lent!!!!!! Great tour, would love to visit. Saw you TOG button, we use it too! Thanks! I’ve fallen in love with the area. I can’t see myself living anywhere else right now! 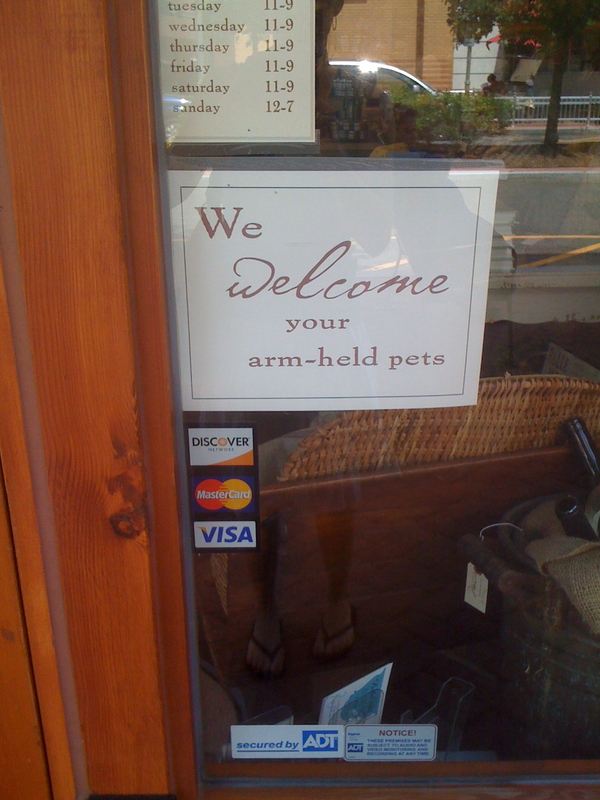 I took a picture of that hand-held pets sign this summer; it struck me as so funny. I have actually been to Arlington. 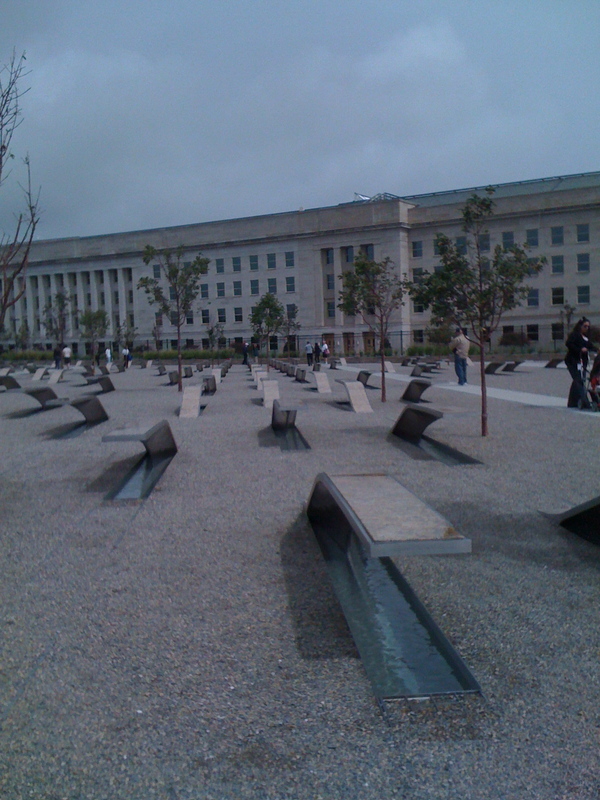 The only thing I did get to see was the Pentagon (from the outside) and the National Cemetery and John Kennedy’s grave. What a sobering experience to walk through and to watch the exchange of duties at the Tomb of the Unknown Soldier. The rest of the vacation, my children were sick so, of course, Mom had to stay at the hotel while Dad got to take the others sightseeing. Oh no! I hope you get to come back. I’m excited to see the cherry blossoms this spring in DC, I’ve never seen those before. Popping by by way of Reno, NV. 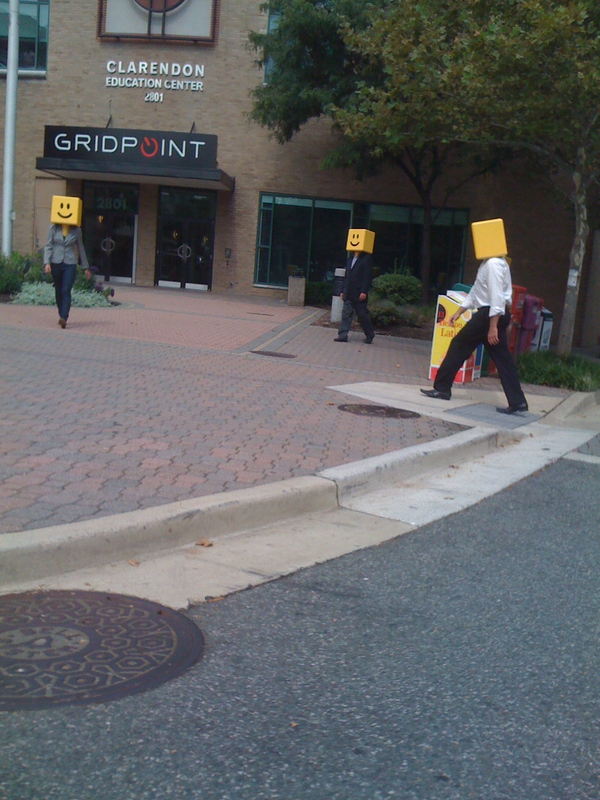 I so want to come visit Arlington! I love all the comparisons to Europe. What an exciting town to live in. Thanks for the tour! From what I hear Spring is a great time to visit! This will be our first spring here and I’m looking forward to it! I watched the video and can’t wait to get a glimpse of the “craziness” that you are surrounded by! I see that you will have a lot to show us when we come! I know I definitely won’t have a problem getting a cup of jo! AAAAGGHHH!!! It’s going to be so much fun! And we can be as hyped up on caffein as you want 🙂 We can start trying to come up with a list of things that you might want to do while you’re here. One thing I want to try while y’all are here is parking at the end of the runways at Reagan International and watching the planes take off and land. I think the boys would like that (both young and not so young)…and Ashlyn…and all of us really. Great post! We just moved to Arlington in September, and we love it too. So much to do with kids in the metro area! I also love all the trails- we live right by two of them, and love walking and seeing all the neighborhoods and parks off the trails. You are right- there are SO many parks. I feel like we have been to tons, and I bet that we have only seen 10% or so. It is a great place to explore! What a great tour! Thanks for letting us tag along! Wow, you made me want to move! Great job on telling us where you live, it really sounds awesome! Oh my gosh, I was just thinking about you last night! Your baby is so big and beautiful now! Well, you should definitely come to DC, there’s so much to do here. I’m hearing that Spring is an especially nice time to visit with the Cherry Blossom Festival and the nicer weather! I have been one time but it was for a day and that was not nearly enough time to see everything. Cherry Blossom Festival sounds like a perfect thing to come and see, thanks for that heads up! I know that I’m terribly late in my Blog Trotting visit and for that I’m sorry. But I’m so glad that I am finally getting around to visiting you. Our family has always wanted to visit Arlington but we have yet to do so. One day we will. I love your blog and I can’t wait to see more of it. Thanks for stopping by! Hopefully you will get a chance to really visit this area sometime soon. There’s something to offer everyone and I’m already afraid we’re going to miss things before we have to move. Hope you make it out here! WOW~ Thanks for the tour! Really does look like an awesome place to live.